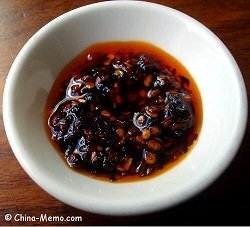 A list of posts for homemade Chinese sauce and ingredients, how we make and use them in our Chinese home cooking. Including videos too. Very often my foreign friends asked me about Chinese sauce or ingredient. For example, one colleague asked, how do you make those Chinese sauce at home? Another friend said, there are so many Chinese ingredients and I have no ideas which one to use and how to use them. So I thought it will be helpful for my visitors, if I can tidy up some of my posts about the Chinese sauce and ingredients that we used for our home cooking. Some of post are videos which I think is to be useful too. I will update this page to add more things about Chinese ingredients and our homemade sauce here. So please stay in connection on my Social networks or subscribe to my Yuotube Channel to get the regular update. In this post, you will see how my parents make chili oil sauce by using the red chili flakes, black bean paste and hot oil. It is a key ingredient in our family daily cooking and dining. This sauce is mainly made by soy sauce, leek and ginger. It is used as the dipping sauce for our Chinese home cooking dish called “Smoked” Fish. Have you thought about making yogurt at home? 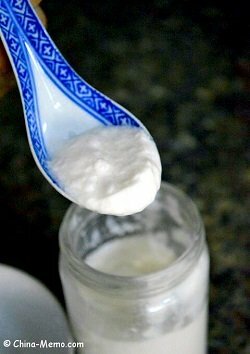 Check my parents' Chinese homemade yogurt, really easy to make. It is one of my favorite breakfast food in China. This video shows how my mum makes the fresh tomato sauce. This sauce is added on the top of a deep fried carp fish, a dish called Chinese pine nut fish, which is one of "big" family dish for the festival time. If interested, you may watch the video of our home cooking for Chinese pine nut fish here. A short clip to show how we make the dipping sauce, which we may use for many of our Chinese homemade soup, such as Chinese Duck & Radish Soup. Here is the video for this Chinese Duck & Radish Soup, so you can see how we use this dipping sauce. Hope you find this page for Chinese sauce and ingredients helpful. If so, please share with friends on Facebook and Twitter. Also please subscribe to my Youtube Channel to get more Chinese home cooking videos.